This blog post is about printing labels from an iPhone or iPad using an app called Address Labels for CardLists. I have another article about how to print just about anything from an iPhone or iPad. Take your pick! It’s time to mail your holiday cards. 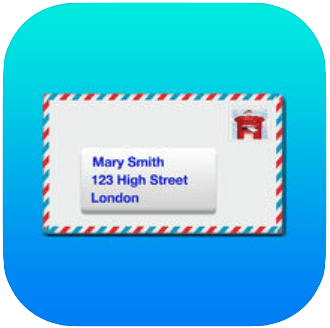 You may recall from previous posts (this one from 2012, and this one from 2014) that when it comes to printing mailing labels from an iPhone or iPad, I really like the app called Address Labels for CardLists. 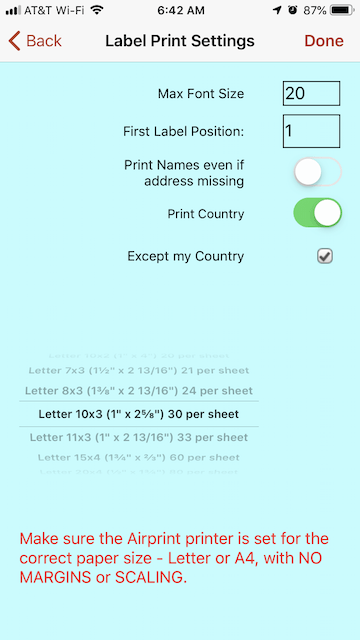 Lucky us: Address Labels for CardLists’ developer updated his app recently, making it even easier to produce good-looking mailing labels directly from our iOS devices. Here’s how the updated app works. Address Labels for CardLists helps you name your list (choose from the scrolling lists or just name your list yourself, as I did.). 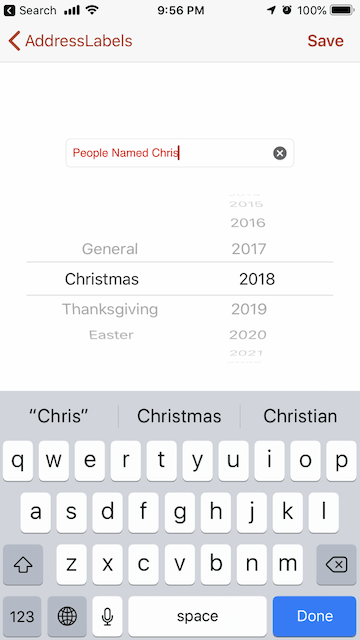 For this example I am going to send a card to people named “Chris” so I’ve named my list that way. Tap “Save” at top right when you’re done. (You can edit the name later if you change your mind so don’t spend too much time on choosing the perfect name.) See below. Here’s my “list of lists” (just the one list). Tapping the circled red “i” would let me rename the list, FYI. Now we want to put some names into our list. 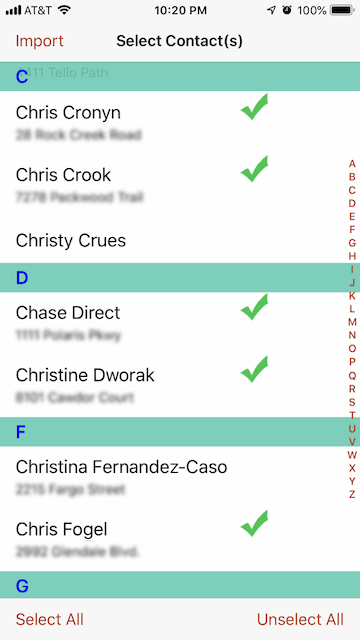 Address Labels for CardLists gives us two ways to do it: copy names and addresses from your iPhone’s Contacts app (easy), and enter the names yourself, for Address Labels for CardLists’ exclusive use (harder). If you’re going to type in addresses, it’s better for you to type them into the Contacts app on the iPhone or iPad rather than directly into Address Labels for CardLists. Then let Address Labels for CardLists pull them in. In this way, your iPhone will “know” about these new addresses, making them available for Maps and other apps that use location data. 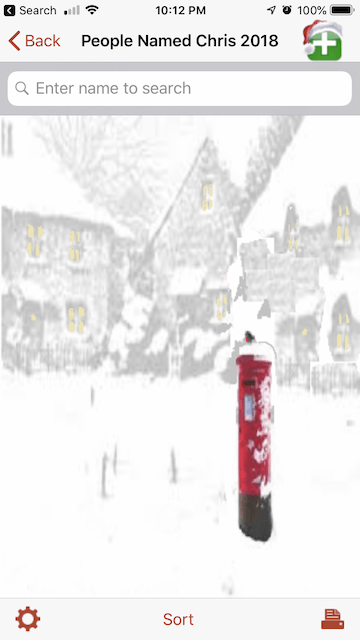 Now you see a nice snowy scene, putting you in the mood for Christmas cards. The part of this screen that really matters is the green “+” topped by a Santa Claus hat. It’s at top right of the screen. Tap it. Now you see your choices (“Add names from Contacts” and “Add names manually.” See below. We’re going to tap the “Add names from Contacts” button, which leads us to a screen asking us to allow Address Labels for CardLists to access your iPhone’s contacts. You have to allow it. If you don’t, Address Labels for CardLists can’t pull in the data. Once you’ve OK’d it, you see this screen. It’s a list of every “Group” in your iPhone’s Contacts list, plus an “All Contacts” choice at the bottom. Now go through the names and tap to put a checkmark next to the ones you want in your list (tap to check, tap again to uncheck). You have “Select All” and “Unselect All” buttons at the bottom of the screen to help in this process. When you’ve checked and unchecked as desired, tap the “Import” button at top left and the checked names will be pulled into your list. 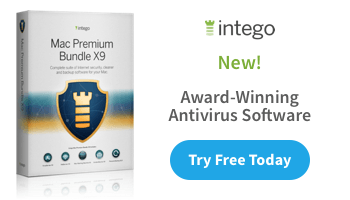 Congratulations– the hard part is done! 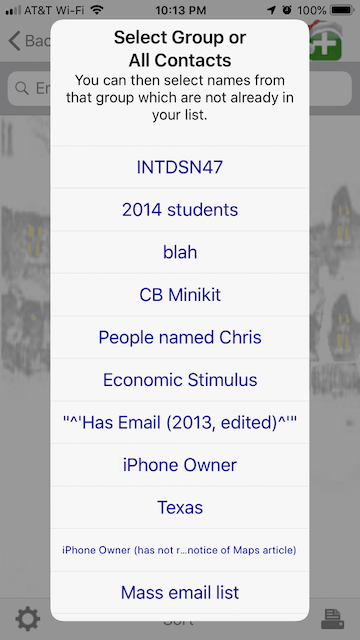 You can choose from various sizes of labels from a scrolling list. The screen also gives you hints for successful printing. We are getting very, very close now! 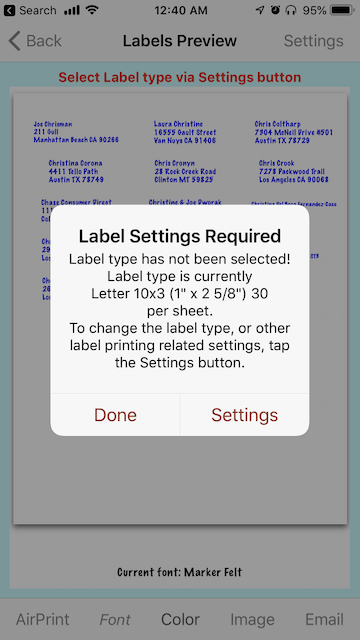 You can print your labels to any AirPrint printer (if your printer is on a WiFi network, and your Phone can join that network, it will probably work), you can change fonts and colors, and you can email the labels as a PDF to someone who will print them for you, and you can tell the app where to start printing in case you’re using a sheet of labels that’s missing a few (very nice, Nigel). If you look closely you’ll see the labels squirm around a bit on the page. That’s OK– the app is just trying to keep things centered on a label by label basis. It also changes font sizes in order to make things fit. Some labels need to be printed in a smaller font in order to fit. The app takes care of that for you. You might change your mind about printing ten down, three across– in that case, tap the Settings button at top right in the Preview screen, and you’ll see the same Settings options we just looked at. First, there’s a backup system that puts a copy of your contact list(s) into your Dropbox folder. 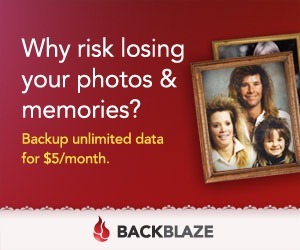 The backups take up almost no room. Make a backup by tapping the Dropbox icon at lower left on the screen that shows the lists (the first screen shown in this tutorial). Second, you can change your mind and remove people from your mailing list. Just swipe left and delete. You can also tap the envelope to the left of a person’s name to show status: you’ve either written that person’s card, or you’ve mailed that person’s card, or you’ve done neither. Just keep tapping until you see the proper indicator. 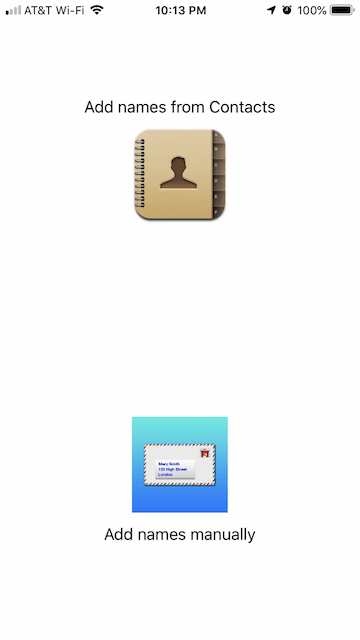 Third, you can indicate that a person’s sent YOU a card by tapping the envelope to the right of the person’s name. 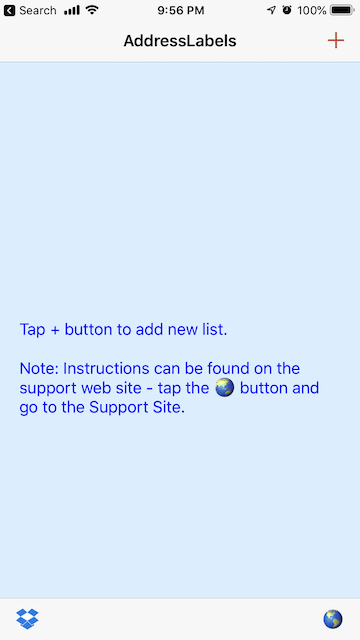 Fourth, there’s a super support website available right from the app in the Address Labels for CardLists window (first picture in this tutorial). Go there by tapping the globe in the lower right corner (or by clicking this link). 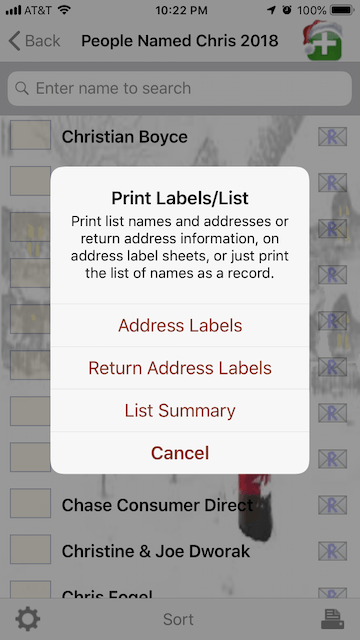 To summarize: if you want to print mailing labels from your iPhone or iPad there’s nothing better than Address Labels for CardLists. Download Address Labels for CardLists from the App Store. Join my mailing list and be among the first to know when I’ve written a new blog post. UPDATE: there’s another label-making app that you ought to try. It’s called “Label Printer.” How’s THAT for being straight to the point? 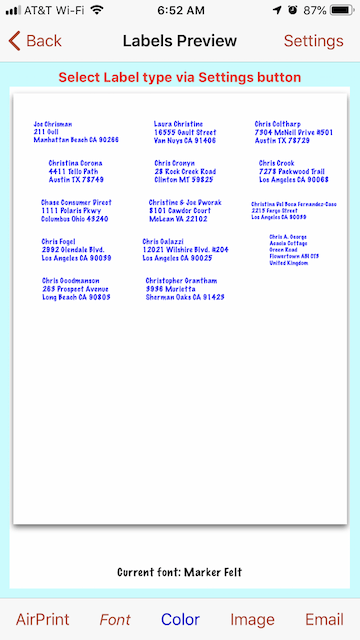 Address Labels for CardLists is Label Printer is worth a look. Click here to get Label Printer from the App Store. I’ve just downloaded ‘label printer’ and can’t increase front size from tiny, any ideas? Hi Penny. The program has settings (two little gears at bottom left) which control a lot of things, including font and maximum font size. If your labels have long lines of text (like a mailing address might have) then you aren’t going to hit the maximum size. The app sizes each label downward until it fits properly on the label. This could result in some labels having larger font sizes than others. and scroll to the bottom to find the developer’s email address. I’ve just discovered this post and it’s very helpful! Thank you! I’m wondering, is there a way to use the My Card List app to export your list to be printed by Avery via the “We Print” feature? 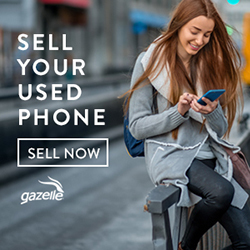 If not, do you have any recommendations for doing so from an iPhone? The only info I’ve found has been Excel-centric. Interesting question. Basically, Avery’s WePrint service wants an Excel-style file– either a native Excel file or a CSV file. MyCardLists doesn’t make that kind of file, and the PDF it generates is not easily converted to a rows-and-columns kind of document. So, I think MyCardLists won’t do it for you (although if I were you I would contact the developer and ask). There are apps that export your contacts on your iPhone to an Excel sheet and you could upload such a file to WePrint. However, I have not found an app that lets you choose a group (they all seem to export all, or make you check the ones you want to export). There may be a better way for you do do this– let’s discuss. Are your contacts ONLY on your iPhone? Do you have an iCloud account (or an Apple ID)? Do you have access to a computer? I need to make labels with name only, not address. Then job description underneath. i.e. This is a little tricky. ContactsPro has two sets of names– those it pulled from Contacts, and those that are entered into it directly. and the label programs that I know about pull from Contacts only. I think you would be better off if ContactsPro allowed you to export the names and Job Descriptions– then you could do something with them, perhaps somewhere else. Contact me directly and let’s see what we can work out. Macman at ChristianBoyce.com. Which program are you using? In Label Printer there are a lot of settings, accessed by tapping the two gears at the bottom center of the screen when getting ready to print. Thank you so much! This post was found after a frustrating day trying to get labels printed. With this app…it was a breeze! How can I remove the default country from my list? 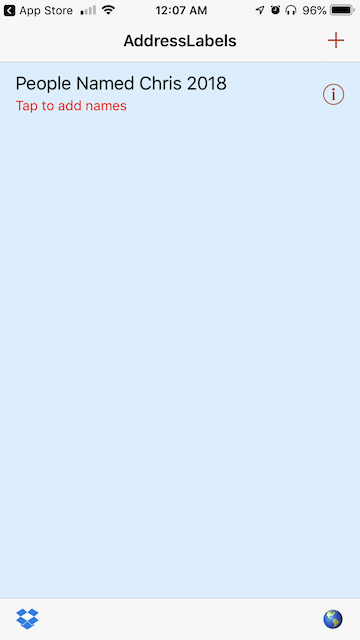 Each of my contacts has United States as the country, and I am unable to remove it. Hi Myra. Despite the country appearing in the Contacts list the actual print-out does not include it. Go through the steps of printing, without quite finishing, and you will see a “Label Preview” screen. 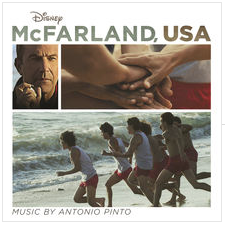 On my iPhone, the country does not show. It does show when I look at each person in the list view, but in the preview of how it will print, the country does not appear. So maybe you don’t have a problem at all.